The iC-MHL Series, consisting of the 2mm pole pitch iC-MHL200 and the 1mm pole pitch iC-MHL100, are integrated Hall encoders for sensing linear and off-axis rotary magnetic targets. The maximum resolution is 12 bits, giving 4096 increments per magnetic period (4mm for iC-MHL200 and 2mm for iC-MHL100). 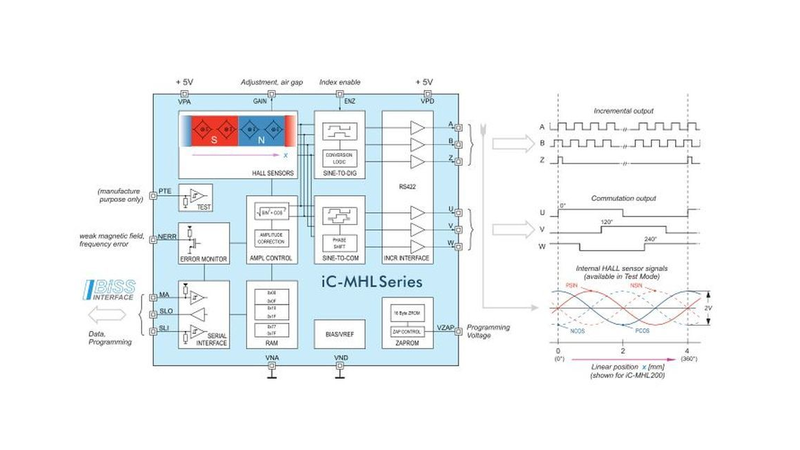 Consequently, iC-MHL200 can achieve 1µm linear resolution, while iC-MHL100 can achieve 0.5µm linear resolution.